The environmental impact of large-scale peptide production can be staggering. In his presentation at the “Avakado Media Peptide” conference held in April, Mimoun Ayoub, Ph.D., vp global business and strategic development at Peptisyntha (a Solvay company), noted that the production of 20 kilograms of an 18-residue peptide generates approximately 300 metric tons of used solvent and other waste. The amount of waste is magnified for a company managing tens of commercial peptides at any given time, and the logistics for waste separation, storage, and disposal can present quite a burden. While purification of crude peptide is the driving force behind the cost of peptide manufacturing, according to Dr. Ayoub, the initial purity of the crude synthetic product is a critical factor in reducing processing costs. To illustrate this point, Dr. Ayoub has analyzed manufacturing costs for the 18-mer linear peptide at different scales and using different synthetic strategies (solid-phase synthesis, solution-phase synthesis, and the hybrid approach). In all cases, raw materials account for 20%–25% of the overall cost of production. “It is important to optimize the supply chain and look for cost-effective suppliers. However, the reliability in terms of quality and delivery time must remain the drivers in the choice of the supplier. The price is important, but should not drive this choice,” he said. Even if alternative suppliers can offer raw materials at a 20%–30% savings, this may translate to only about a 5% reduction in the overall cost of API manufacturing, and this savings must be balanced against the risks associated with purchasing from a potentially unreliable supplier. These risks include the quality and purity of the materials and potential variability in delivery time. “Improving the crude purity by only 10 percent may result in a cost saving of >50 percent after purification and lyophilization,” added Dr. Ayoub. Another decision peptide producers must grapple with, noted Dr. Ayoub, is whether to develop a solid-phase or liquid-phase synthesis scheme. 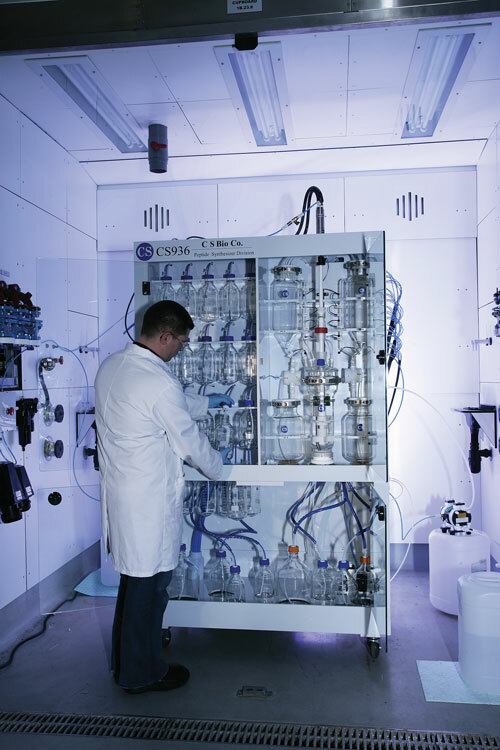 Solid-phase peptide synthesis offers the benefits of shorter process development and manufacturing time and greater cost efficiency at smaller scale, but he contends that solution-phase synthesis may be more advantageous as product quantities increase. Decisions should be made on a case-by-case basis, he suggested, based on a clear understanding of the advantages and limitations of each approach and the potential regulatory hurdles associated with changing a process mid-stream in development and scale-up. For a CMO, both the evolution of synthesis and purification technology and changing customer demands drive innovation. Jan Pawlas, Ph.D., a member of the process development and support team at PolyPeptide Group (PPG), described two over-arching trends: an increased focus on the economic aspects of peptide manufacturing, and a demand for shorter delivery times. In Dr. Pawlas’ view, a well-developed, efficient solid-phase synthetic process is suitable not only for small- to medium-scale production, but can also remain competitive for larger-scale processes and for producing longer sequences and more complex peptides with elaborate side chains. The key is to optimize process development and achieve highly efficient conversion at every amino acid coupling to produce a high-purity crude synthetic peptide and minimize the demands on downstream processing. “If extensive purification is needed, then liquid-phase synthesis can become more competitive,” said Dr. Pawlas. The path to more cost-efficient solid-phase peptide synthesis begins with a knowledge and experience base that allows a CMO to shorten the process development time and select an optimal synthetic route from the outset, according to Dr. Pawlas. The other two main considerations in designing an efficient process are the quality and characteristics of the raw materials (amino acids, linkers, and coupling reagents), and selection of the resin. Quality of the amino acids is paramount, and the ability of manufacturers to purchase monomers in bulk for use in multiple projects provides economies of scale. PolyPeptide Group has created a global sourcing program to coordinate the needs and purchasing activities across its global sites to benefit from better availability and lower prices for materials and equipment acquired in large quantities. Additionally, standardization of purchases simplifies the transfer of processes, technology, and projects across sites. For resin selection, PPG screens batches of many different resins (acquired from commercial sources as well as novel materials developed in academia) with a variety of test sequences and under varying conditions. The goal is to identify a suitable polystyrene bead-based resin when possible to keep costs low. Dr. Pawlas emphasized the importance of testing every new batch of polystyrene resin, as standard resin manufacturing can yield substantial batch-to-batch variation in quality due to uneven distribution of functional groups across the resin beads, for example. Compared to traditional polystyrene bead manufacturing methods, copolymerization of the functionalized monomers “is the process of choice and could dramatically improve the yield of large-scale peptide synthesis and shorten production times,” he said. Linker selection is an underappreciated aspect of solid-phase synthesis, according to Dr. Pawlas. For example, instability of linkers under standard Fmoc deprotection conditions may lead to the loss of valuable quantities of peptide product. “This loss is not accounted for, as you will not see it in the crude peptide,” he explained. However, even a simple process change such as altering the composition from dimethyl formamide (DMF) to DMF/toluene can tremendously increase the stability of certain linkers during Fmoc deprotections,” he added. Selection of coupling reagents also affects synthesis efficiency, as they play a critical role in mediating the formation of amino bonds during the coupling of each amino acid. Even small changes in temperature, solvent composition, concentration of the coupling reagent, or pH can all have a large impact on peptide yield and the occurrence of undesired side reactions. “Not only the choice of the coupling reagent, but how you utilize it can make a big difference in process efficiency,” Dr. Pawlas concluded. PolyPeptide Group has standardized its equipment purchases globally in order to simplify the transfer of processes, technologies, and projects across sites. As the length of therapeutic peptides increases, so too do the synthetic challenges, as described by Hazel Moncrieff, Ph.D., senior group leader, GMP peptides, Almac Sciences. Errors in amino acid addition to a growing peptide strand are compounded as the peptide lengthens and can greatly compromise the quality of the final product. “The coupling efficiency at each synthesis step must be extremely high,” resulting from a robust and reproducible synthetic chemistry process, said Dr. Moncrieff. She described Almac’s expertise in producing long peptides and the company’s ability to synthesize peptides greater than 100 amino acids in length routinely. She also reported the successful production of peptides as large as 200 amino acids using solid-phase synthesis. A key factor in producing long peptides is resin selection to optimize solubility of the forming peptide and minimize aggregation. Another important factor is post-synthesis product characterization and the need for high resolving analytical methods such as UPLC and LC/MS to differentiate full-length peptides from impurities, which are mainly shortened peptides that lack the full complement of amino acids, and which typically elute together with the full-length molecule on separation. Almac is pursuing in-house research to develop purification technology that Dr. Moncrieff believes will enable production of even longer peptides using solid-phase synthesis. The company is currently testing these new LC-based techniques in small-scale development work, and Dr. Moncrieff reported preliminary findings that demonstrate their ability to increase product yield. Commenting on industry trends in general, Dr. Moncrieff described an increase in project complexity, with customers requesting the production of both longer peptides and more multicomponent products, in which the API contains a mixture of multiple peptides. “We are also seeing an increase in the breadth of projects,” she said, referring to growing interest in Almac’s rapidd™ service package that integrates chemical and process development and analytics for API synthesis, drug production, preclinical safety studies, and testing and documentation to support regulatory filings. Almac Sciences offers cGMP production of long peptides using an automated solid-phase peptide synthesizer. The presentation by peptide manufacturer Bachem highlighted the increasing complexity of peptide-based medicines. Lester Mills, chief marketing officer, credited improved analytical techniques amenable to batch processing, mainly UPLC, with providing an enhanced capability to resolve impurities and, thereby, improve process efficiency for the production of longer peptides with more challenging sequences. “We once thought of the synthesis of proteins as being in the realm of recombinant technology, and peptides in the realm of chemical synthesis,” said Mills. “But these lines are blurring.” With the ability to make peptides of 100 amino acids and longer, “we are getting into the realm of making small proteins” using solid-phase peptide synthesis techniques. As the frontiers of synthetic chemistry advance, “we can now synthesize peptides we previously could not,” added Mills. As an example, he points to relaxin, a member of the insulin family, which Bachem now offers in its catalog. “The nature of the sulfur bridges in relaxin make it very challenging to synthesize,” Dr. Mills explained. Other advances that are creating new opportunities for peptide therapeutics include novel drug delivery strategies and the development of therapeutic peptide conjugates. Bachem is seeing an increasing number of projects involving conjugates that combine peptides with small molecules, cytotoxic compounds, or oligonucleotides, for example, reported Dr. Mills. Through the use of improved analytical techniques, Bachem reports that it is able to offer greater process efficiency for the production of longer peptides with more challenging sequences. In June, SpheriTech introduced SpheriTide™, a polymer support for solid-phase peptide synthesis. These polymeric microspheres are composed of peptides, specifically ε-lysine residues cross-linked with multi-functional carboxylic acids. In the SpheriTide polymer, amide bonds form between the α carboxyl and ε amino groups of lysine, whereas typical peptide bonds form between the α carboxyl and α amino groups of two linked amino acids. The relatively low cost of poly-ε-lysine, an FDA-approved food ingredient that is commercially available at high purity in bulk scale—produced by bacterial fermentation—gives SpheriTide “the potential, with economies of scale, to be cheaper than polystyrene,” said Don Wellings, Ph.D., founder and CEO of SpheriTech. He described the ability of the resin’s microporous polymers to swell and solvate and to provide many of the favorable qualities of traditional polystyrene-based support materials. 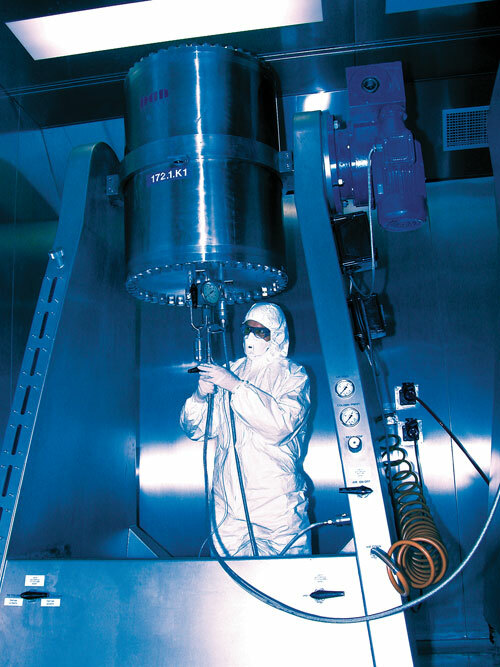 Compared to some new, more hydrophilic support materials, such as polyethylene glycol-based resins, SpheriTide microspheres are not sticky and do not adhere to reactor walls. The cross-linked poly-ε-lysine is biodegradable, with complete enzymatic degradation yielding the polymer’s amino acid components. The new solid support has resulted in improved product quality and quantity compared to traditional methods for all test peptides synthesized to date by SpheriTech, Dr. Wellings reported. 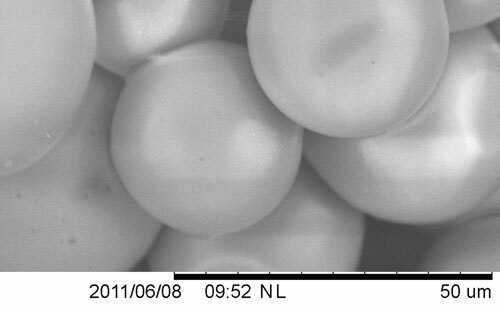 SpheriTide™ polymeric microspheres for solid-phase synthesis consist of poly-epsilon-lysine cross-linked with multifunctional carboxylic acids. The peptidic nature of the polymer backbone is probably the optimum environment to assemble a peptide by solid-phase chemistry, ultimately forming a true quasi-homogeneous peptide-gel network, according to SpheriTech. A peptide synthesis and manufacturing process can have upwards of 50 steps, introducing a large margin for error but also a substantial opportunity for process optimization. Compared to some synthetic processes, for which a 96%–98% product yield at each process step might seem sufficient, for a process with 50+ steps, little product would be left to recover at the end of the process. In peptide manufacturing, therefore, “you need an average 99+ percent yield at each step, and there is little room for error,” said Didier Monnaie, Ph.D., project leader, Lonza, and Six Sigma Black Belt. He described the implementation of Six Sigma at the Lonza Braine peptide manufacturing facility over the past three to four years. Whereas a quality by design (QbD) approach and intensive process optimization require a great deal of up-front process development, analytical work, and comparative testing—and the associated costs—the ultimate rewards can be substantial in terms of time, labor, resources, and costs saved by maximizing process efficiency, product quality and yield, and overall productivity. A well-defined process with clearly documented specifications, optimized process parameters, and well-studied operational ranges developed for small-scale production will also minimize potential problems on scale-up, noted Dr. Monnaie. It can help avoid the need for second-generation process development. Furthermore, a QbD approach provides the opportunity for additional process optimization in the future, within clearly proscribed limits, after regulatory review and product approval, allowing for continued improvements in efficiency and cost savings. Working with Six Sigma experts, Lonza developed a six-step QbD approach within the framework defined by the FDA. A key facet of this approach is the development of critical quality attributes (CQAs), which relate to the characteristics and constraints of a specific product as required by a particular customer. Dr. Monnaie emphasized the importance of defining and documenting CQAs from the outset of process development, using them as a guide to help stay focused on the goals of a project.Process development has traditionally been more empirical, based on fixed parameters, and has mainly focused on optimizing one factor at a time. In contrast, QbD provides a better understanding of process variability, depends on process risk assessments to define an operational range for process parameters, and incorporates a multivariate design of experiments methodology that can optimize multiple parameters in parallel and identify critical interactions between individual factors. As an example of the value of applying quantitative Six Sigma tools, Dr. Monnaie described how Lonza has used these tools to document a seasonal effect that was compromising process efficiency. The availability of detailed process specifications and statistics led to the identification of a seasonal change in the temperature of incoming solvents as the cause of decrease in efficiency. 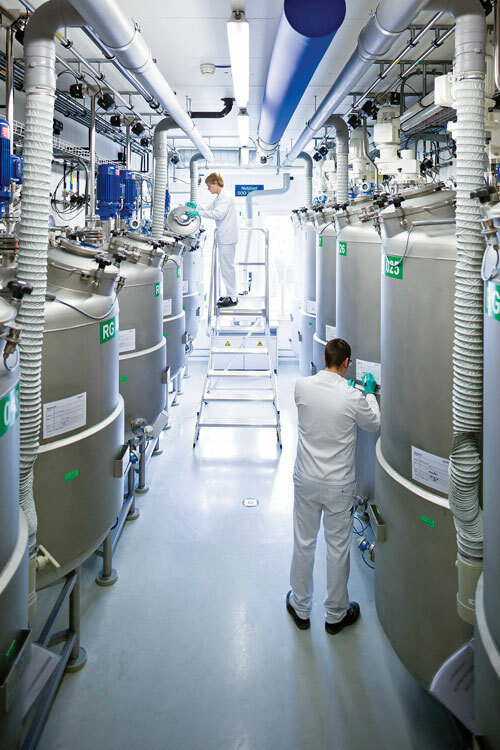 Lonza utilizes large-scale chromatographic columns for peptide purification. 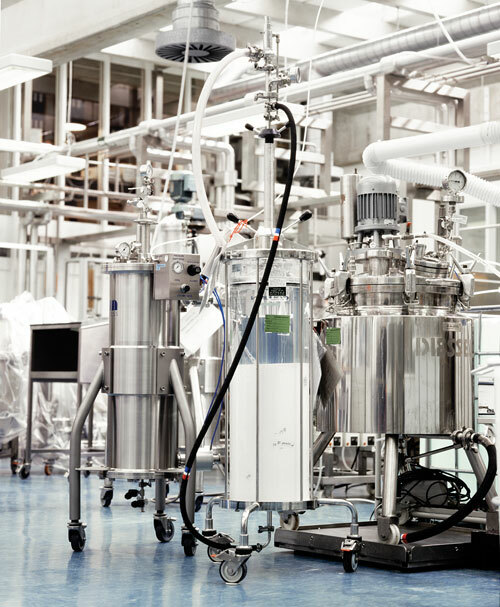 The growing pipeline at Bachem mirrors the rising number of peptide manufacturing projects industry-wide, noted Mills. The number of development projects under way at the company (preclinical through Phase III) increased from 120 in 2009 to 138 in 2010; Phase III projects in particular rose from 16 to 25. Similarly, manufacturing projects to produce peptides already on the market (either for new indications or for introduction into additional countries) climbed from 71 to 86. The value of the peptides market continues to show strong growth, according to Mills, with 2010 figures totaling $15 billion for therapeutic peptides, nearly $600 million for peptide APIs, and $200 million for the research market. “The peptide industry is extremely strong in Europe and North America,” observed Mahendra Menakuru, CEO of Protein Technologies (PTI). He attributes PTI’s four consecutive years of double-digit growth to the successful launch of its peptide synthesizers into these and other markets. PTI’s most recent product offerings are the Overture™ robotic peptide synthesizer, which is capable of synthesizing 96 peptides at a time and running six different protocols simultaneously, and the Tribute™ benchtop peptide synthesizer, which features the IntelliSynth UV-monitoring and feedback control option that can capture UV readings every few seconds during the deprotection reaction, providing real-time feedback and control of the length of the deprotection step and the number of repetitions.